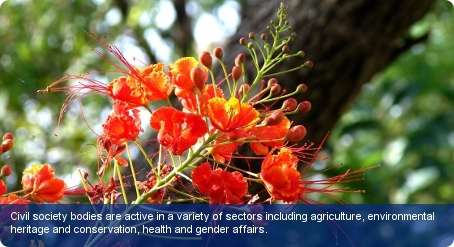 Civil society bodies are active in a variety of sectors including agriculture, environmental heritage and conservation, health and gender affairs. The Caribbean Conservation Association and the Barbados National Trusts are leading environmental non-governmental organisations (NGOs) that run a number of sustainable management programmes for the country’s natural and cultural resources. They are financed through fees based on voluntary membership, grants and donations. Active organisations in the area of health include the Heart and Stroke Foundation of Barbados which assists in efforts to prevent heart disease; the Barbados Cancer Society which dedicates itself to the prevention and alleviation of pain and suffering from cancer; and the Barbados Road Safety Association. An influential body in civil society and its role in governance is the Barbados Association of Non-Governmental Organisations (BANGO). BANGO facilitates the cohesive involvement of Barbadian civil society in national and international matters through the provision of technical and other forms of support. Primarily, there are two main trade unions in Barbados which include the National Union of Public Workers and the Barbados Workers’ Union, both established in the early-1940s and are both members of the Congress of Trade Unions and Staff Associations of Barbados (CTUSAB). Other members include educational and health organisations.